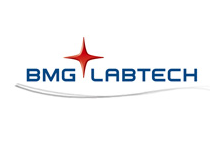 BMG LABTECH’s innovative absorbance microplate reader has the flexibility to perform assays quickly and easily in both microplates or via the built-in cuvette port. This spectrometer-based absorbance microplate reader captures a full UV-visible spectrum in less than 1 sec/well. 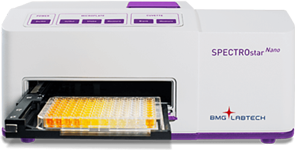 Its speed, simple push button operation, and capacity to store individual assay protocols make the SPECTROstar® Nano the ideal microplate reader for absorbance measurements. Ultra-fast determination of DNA, RNA, ELISA, and more. The SPECTROstar Nano is equipped with BMG LABTECH’s ultra-fast UV/Vis spectrometer, which allows users to measure full-spectrum absorbance (220 – 1000 nm) in less than 1 second per well. It is the ideal instrument to read all absorbance assays in a microplate or cuvette – with many common assay protocols predefined and available at the click of a mouse.